Ready to bake liquid chocolate cake batter. 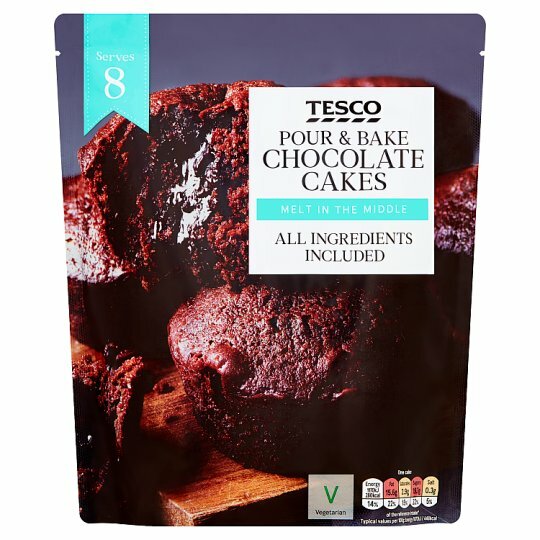 Sugar, Rapeseed Oil, Water, Wheat Flour, Cocoa (9%), Dried Egg, Stabilisers (Glycerol, Xanthan Gum), Raising Agents (Disodium Phosphate, Sodium Bicarbonate), Wheat Starch, Preservative (Potassium Sorbate), Salt. May contain soya, almond, hazelnut and pecan. For allergens, including cereals containing gluten, see ingredients in bold. Instructions: Preparation Guidelines: You will need: 8 muffin paper cases and a muffin tray (or 8 greased ramekins) or a 20cm (8 inch) greased and lined round baking tin. Individual cake method: 1. Pre-heat the oven to 200⁰C/Fan 180⁰C/Gas Mark 6. 2. Place the muffin cases into a muffin tray. 3. Empty the contents of the pack equally in each muffin case. Squeeze the pack well, pressing from bottom to top until it’s completely empty. 4. Bake in the centre of the oven for 17-18 minutes, turning half way through. 5. Remove from the oven and allow to cool for 5 minutes before transferring to a cooling rack. 8 inch cake method: 1. Pre-heat the oven to 200⁰C/Fan 180⁰C/Gas Mark 6. 2. Empty the contents of the pack into the baking tin. Squeeze the pack well, pressing from bottom to top until it’s completely empty. 3. Bake in the centre of the oven for 20-22 minutes, turning half way through. 4. Remove from the oven and allow to cool for 5 minutes before transferring to a cooling rack.